I had planned Ianthe Jerrold's Dead Man's Quarry (1930) as my next read, but, once again, got sidetracked. However, I hope to read it somewhere around the weekend. So a review is coming! In the meantime, I dipped into the twelfth entry in the Bureau Raampoort-series: Een schim in de nacht (A Shadow in the Night, 2015). The series was co-created by Simon de Waal and Appie Baantjer, but the former had to continue solo after Baantjer passed away in 2010. A Shadow in the Night begins when summer is finally on the horizon and evenings are slowly growing longer, which draws a veteran of the Amsterdam police, Peter van Opperdoes, from his home and into his favorite café – to enjoy coffee and apple pie. It's a quiet, peaceful moment broken by the sound of gunfire emanating from the nearby Noordermarkt. Van Opperdoes finds a mortally wounded man, recipient of several bullets, who clings to life long enough to mutter these cryptic last words: "ik was het zelf" ("I did it myself"). The nature of the bullet wounds and the absence of a firearm on the body makes suicide unlikely, which is confirmed when a gun and shell casings are found a considerable distance away from the body. But then what did the victim mean that he did himself? Jacob thinks it was simply the incoherent ramblings of a dying man, but their inquiries soon open new avenues of investigation. The identity of the victim is confirmed when his twin brother reports him missing, which gave Van Opperdoes and Jacob quite a fright in the beginning – as they were confronted with him just after bringing the body to the morgue. I was hoping the body would disappear from mortuary, but this is a contemporary, Dutch politieroman and not a John Dickson Carr novel from the 1930s. Ideas of mistaken or swapped identities was entertained, but the eventual solution ran in a different direction and was stamped with De Waal's trademark signature: professional underworld figures, small-time, petty criminals and other, enterprising persons operating in the gray areas of the law, who always seem to lurk in one place of a story or other. There are several kinds of them in this story and there's professional in a short, separate story line and a second, unnecessary murder for the story – one that's solved after discovering the crime-scene was stuffed with hidden surveillance cameras that recorded the murder. There are some petty crimes and criminals involved in the first shooting, but the explanation yielded an unexpected surprise, which was only (somewhat) foreshadowed in the characterization of the people involved. But the surprise was welcome! Unfortunately, the "dying message" was just a red herring to mystify rather than a clue to the identity of the murderer. As Jacob remarked, "it would saved us a lot of hassle if he simply had said (...) had shot him." Interestingly, the final parts of the book were apparently penned with a deadline looming ahead, because Van Opperdoes figures out the case while watching footage of the Baltimore riots on TV. Yes. There's something in footage that helps Van Opperdoes to grasp the explanation. 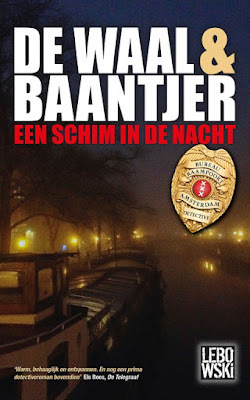 All in all, a good entry in this series of police procedurals, but the best part remains how Baantjer has been kept alive through De Waal's storytelling and Van Opperdoes' character – which is simply nostalgia for me. It was Baantjer who introduced me to the genre and I sometimes miss those heretical days when I used Agatha Christie to bridge the time between the releases of his books. "There is a tide in the affair of men. Which, taken at the flood, leads on to fortune." The title of Paul Doherty's eight Sir Hugh Corbett mystery, Song of a Dark Angel (1994), is the name locals of Hunstanton Bay have given to the cold, howling wind blowing across the Wash – a large, inland sea in the Norfolk countryside. Reputedly, the small, sleepy fishing village is the final resting place of many old, nearly forgotten secrets. It's November, 1302, when King Edward I of England dispatches Sir Hugh Corbett, Keeper of the Secret Seal, and his loyal friend and companion, Ranulf-atte-Newgate, to this "dark, sombre place." On a cliff top, a local woman was found swinging from the scaffold. On the beach below lay the remains of a decapitated man. The head was impaled on a spike and planted next to the corpse, but the sandy terrain surrounding both bodies showed no signs of disturbance – aside from those that could be attributed to the victims. Regrettably, the impossible nature of both crimes remained tiny cogs in the machine of the plot, but, considering their simplistic explanations, that may've been for the best. You should be able to figure out how the hanging was done and make a good guess at the second one, but Song of a Dark Angel is definitely not a full-blown locked room mystery. 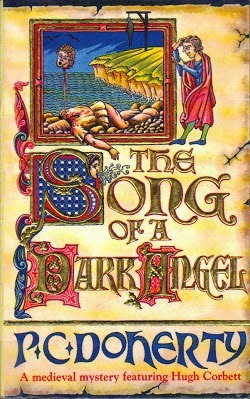 Song of a Dark Angel is better described as a grim, medieval village mystery with enough background noise to keep both Corbett and the reader continuously distracted from the first two murders. First of all, there are the Pastereaux, a religious sect, who are preparing for the return of Jesus Christ and ship off the converted to Holy Land. Old grave sites are being desecrated and light signals have been witnessed along the coastline, but a far more imminent threat came from the villagers after another local girl, named Marina, was found raped and murdered on the moors – which gathered an angry, pitchfork-mob around an elderly lady and her son. The woman is known locally as a witch and even the ducking stool is pulled out for this portion of the story. However, my favorite plot strand, woven through the others, involved King Edward's actual motives for sending Corbett to a desolate place for an apparently routine investigation. A reason that harked a century back into the past, which were the days of Edward's grandfather. King John of England is best known today in popular fiction as the arch-nemesis of Robin Hood, but in his day he was responsible for losing the French territories, probably murdered a rival claimant to the throne and caused a baronial revolt that led to Magna Carta – "The Great Charter of Liberties." As the story goes, King John "spent most of his reign fighting his barons, moving around the country, trying to bring this earl or that lord into submission," but during a crossing of the Wash he lost something rather valuable. This lead to a fun, but deadly, treasure hunt a hundred years later. What I loved about this plot strand is how it really gave a deeper sense of time-and place to the story, because it's not just a story set in the early years of the 1300s. It was set in a place with a history. A place where the Vikings once landed and the Danes invaded, but it was as ancient history as the events from the days of King John and seemed as distant to them as 1915 does to us. Overall, Song of a Dark Angel is a well-written historical novel and a fairly honest plotted detective story, which kept (for Doherty) a surprisingly balanced body count, but the setting was deserving of a grander story. I did enjoy most of the plot, but I have seen better from this series in only the handful of titles read thus far. However, that probably won't stop devotees of the series and historical (crime) fiction in general from enjoying Song of a Dark Angel. "Do you promise that your detectives shall well and truly detect the crimes presented to them, using those wits which it may please you to bestow upon them and not place reliance on nor making use of Devine Revelation, Feminine Intuition, Mumbo-Jumbo, Jiggery-Pokery, coincidence or the Act of God?" The Detection Club was founded in 1928 by Anthony Berkeley in London, therefore it's often referred to as the London Detection Club, which began to officially function in 1930 with G.K. Chesterton serving as its first honorary president – occupying that seat until passing away in 1936. A number of round-robin novels and volumes of shorter fiction has appeared under the byline of "The Detection Club," such as the amazingly consistent The Floating Admiral (1931), but their first collaboration didn't appear in book form until half a century later. 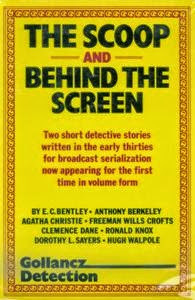 The Scoop & Behind the Screen (1983) were originally broadcast as weekly serials on the BBC in the early 1930s and the scripts of the plays were published a week later in a radio magazine, The Listener. The Scoop (1931) was penned by an impressive collection of names, Agatha Christie, E.C. Bentley, Anthony Berkeley, Freeman Wills Crofts and Clemence Dane, whom all contributed two or more chapters to the story. First of all, the contributions by Berkeley and Sayers were the highlights of this volume, which was a showcase of their writing abilities. In the opening chapter, Sayers sketches a great picture of the impatient hum at a news paper office, the Morning Star, waiting for a last-minute break in connection with a big story – foreshadowing the hustle and bustle of the advertising agency in Murder Must Advertise (1933). Morning Star expects front-page, breaking news in the "Lonely Bungalow Mystery," which is what the papers have dubbed the question riddled stabbing-death of Geraldine Tracey. The police failed to find the murder weapon at the scene of the crime, but one of their reporters, a Mr. Johnson, called the office to report that he found the knife. Johnson was supposed to return, by the next train, but never made it back. His body is eventually discovered in a telephone boot at Victoria Station. And, of course, the murder weapon has, once again, vanished! One of their most experienced star-reporters, Denis Oliver, is put on the story and does a considerable amount of snooping into Tracey's missing husband, the possibility of double-identities, tracing a pair of jade-headed objects from Bond Street to Broad Street and testing the soundness of a couple of alibis – which often seem to directly lead back to the offices of the Morning Star. These old-school, journalistic endeavors are occasionally interrupted with chapters from Croft, which gave Scotland Yard's take on the ongoing proceedings, but it was Christie who left a very discernible mark on the plot – with the "Eternal Triangle" being the most obvious one. So, all in all, The Scoop was a good, enjoyable mystery that remained consistent in spite of the number of writers involved. Behind the Screen (1930) aired a year before The Scoop and the writers of this piece were: Agatha Christie, Hugh Walpole, E.C. Bentley, Anthony Berkeley and Ronald Knox. The story is also listed in Robert Adey's Locked Room Murders and Other Impossible Crimes (1991), but, in reality, it's the literary embodiment of a drawing room-style mystery. The story focuses on the Ellis-family and Wilfred Hope, engaged to Amy Ellis, who's worried about the negative, unhealthy atmosphere their paying guest, Paul Dudden, has on the family. And on Amy. One evening, in the drawing room of the Ellises, Hope discovers Dudden's bleeding body behind a large, old-fashioned Japanese screen. The problem is that everyone in the drawing room could be accounted for, but forensic evidence about the nature of the stab wounds and witness testimonies give more wriggle room – which is why I place this closer to a drawing room mystery (e.g. Agatha Christie's Cards on the Table, 1936) than a proper impossible crime. I quite enjoyed the bits and pieces of building up, and tearing down, theories and the possibility of playing a game with two suspects (who gave the fatal jab? ), but Knox took the amateurish part of the final chapter somewhat literarily. A shoehorn was whipped out to make everything fit and the rules of fair play weren't entirely observed, which made for an underwhelming ending. The only interesting part (for me) to arise from Behind the Screen was that the plot contained germs of ideas that obviously manifested, fully developed, a couple of years down the line in one of the most famous Hercule Poirot novel from the series. The Scoop & Behind the Screen is that proverbial mixed bag of tricks, but the first story is too good for a curiosity to be ignored by connoisseurs of Golden Age mysteries and definitely of interest to the rabid Agatha Christie fan. "Though everything will seem dark to you now, remember that even behind the darkest clouds of night there shines the moon of dawn." The Body Snatchers Affair (2015) is the third, full-length novel in the historical Carpenter and Quincannon series, which began with a standalone book, Quincannon (1985), that formed the basis for a series of magazine stories and an excellent selection of those stories – collected as Carpenter and Quincannon: Professional Detective Services (1998). 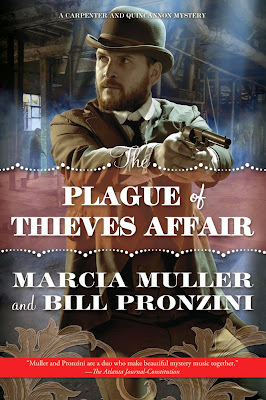 In 2011, I announced on my blog that the William Roos and Aubrey Kelley of our time, Bill Pronzini and Marcia Muller, were collaborating on a series of novels starring the duo of gumshoes operating in the San Francisco of the late 1890s. The Bughouse Affair (2013) and The Spook Lights Affair (2013) were the first to appear and The Plague of Thieves Affair (2016) is slated for release early next year, but first let's take a look at The Body Snatchers Affair. The lion's share of The Body Snatchers Affair is modeled around the plot of a short story, "The Highbinders," from Carpenter and Quincannon: Professional Detective Services, in which the body of a Tong leader, Bing Ah Kee, is unceremoniously snatched from his coffin – a potential triggering move for a small-scale civil war on the streets of Chinatown. Quincannon is hired to fetch a drug-addicted lawyer, James Scarlett, from an opium den, but his half conscious quarry is fatally shot while attempting to carry him out of the Chinese Quarters. The last words Scarlett uttered, "blue shadow," amounts to a dying message, however, the explanation for this part of the plot is the same as in the short story. So it won't yield any surprises, if you've read and remember that particular story, but a good and interesting expansion nonetheless. While Quincannon attempts to quell a rising fire in Chinatown, Sabina Carpenter has one or two problems of her own to take care of, one professional in nature and the other personal, but in both cases she tries to keep Quincannon in the dark as much as possible. The professional problem concerns a client of hers, Mrs. Blanchford, who received a $75,000 ransom note for the return of her late-husband's remains. Mrs. Blanchford's husband was interred in the family mausoleum and the door can only be opened with a key that was in a safety-deposit box inside a secured bank building, but the note contained Ruben Blanchford's wedding ring and a piece of satin cut from the lining of a casket. It's completely impossible to enter the solid looking, family crypt and take away the body, but the casket proved to be indeed empty upon inspection – which is what is being carefully kept from Quincannon. Sabina knows he would insert himself in her investigation, because Quincannon "fancied himself an expert on that sort of mystery" and wants to solve this locked room case herself. If, like me, you fancy yourself a student of the Grandest Game in the World (the obligatory John Dickson Carr reference) then the disappearance from the crypt won't pose much of a challenge for you, but that doesn't make withholding an impossible problem from a locked room enthusiast any less reprehensible. That's like taking painkillers from a sick person. You just don't do that. However, I enjoyed how the two seemingly unrelated cases of body snatchings dovetailed with each other without actually being intertwined. The personal problem begins with Carson Montgomery, a metallurgist, who's vying for spot coveted by Quincannon, but Sabina (a former Pink Rose operative) has always been resistant to male advances (especially Quincannon's) ever since losing her husband in the line of duty. Just when Sabina thinks Carson may be the new man in her life, she notices an old, familiar face is watching them. The crackpot who claims to be Sherlock Holmes, first appearing in The Bughouse Affair, has been shadowing them and this eventually leads to a mining scandal from a decade ago and an (unsolved) murder in the background. But more importantly, it casts an interesting light on the bughouse Holmes and his possible role in the next novel. My theory: the twist is that the bughouse Sherlock Holmes was Professor Moriarty all along, who thought Quincannon was the actual Holmes in hiding and that gray-flecked, bootleggers beard one of his disguises. 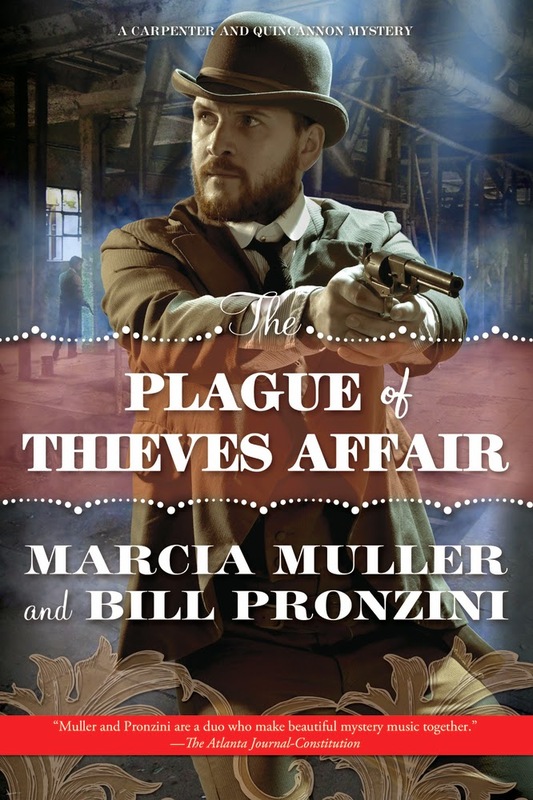 The Plague of Thieves Affair could be a hint at Moriarty's next big caper. 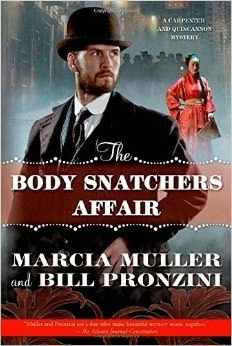 Conclusion: The Body Snatchers Affair has everything what you've come to expect from Pronzini and Muller, but be warned, the book contains material that readers who were onboard with series before 2013 are already familiar with. That being said, I can't wait for the release of The Plague of Thieves Affair. I'm sure it'll contain another impossible problem or two. "Well, one of us must have killed him!" Last year, the first officially sanctioned Agatha Christie pastiche, The Monogram Murders (2014) by Sophie Hannah, was released and garnered criticism for its implausible, convoluted plotting and inaccurate portrayal of Hercule Poirot. The estate has always been protective of Agatha Christie's intellectual property and never allowed an author to pen a continuation or a previously unrecorded case in one of her series before, which is probably why this one fell short of the mark. 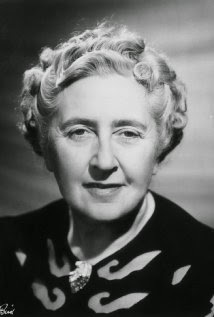 For over ninety years, the only standard for an Agatha Christie novel was set by the Queen of (Golden Age) Mysteries herself, which is a tough bill to fill for any contemporary crime novelist. It would be like asking Napoleon III to equal Napoleon I on the battlefield. Sure, you could expect the same results, but disappointment probably won't be trotting far behind those expectations. 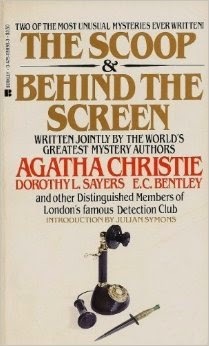 How different was the situation at the beginning of this millennium: there was still entire stack of Hercule Poirot mysteries to be filmed, Miss Marple eagerly awaited a return to the small screen and a handful of stage plays were being novelized by Charles Osborne – a journalist and author of The Life and Crimes of Agatha Christie (1982). During the late 1990s, early 2000s, HarperCollins were reissuing all of Christie's book in hardback in the order they were originally published, which included new material such as Black Coffee (1998), The Unexpected Guest (1999) and Spider's Web (2000) – novelisations of stage plays that didn't endure the same, long-running success of The Mousetrap (1952-present). Well, in my time away from this blog, I serendipitously came across a beautiful, hardcover edition of Spider's Web and finally got around to reading it. You know you're reading a previously unexplored minefield by Christie, when you find out you have been eyeing the wrong suspect the entire time. 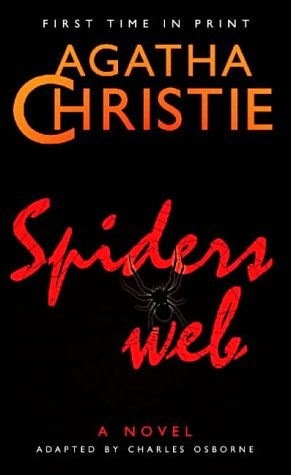 Christie wrote Spider's Web in 1954 for "the British film star, Margeret Lockwood, who wanted a role that would exploit her talent for comedy" and "stayed for 774 performances" at the Savoy Theatre in London. The story opens at Copplestone Court, eighteenth-century country home of Henry Hailsham-Brown, Foreign Office diplomat, and his wife, Clarissa, who's entertaining friends and waiting for her husband to return home from work. It's a warm, homely picture that's disturbed when a man named Oliver Costello is announced by the butler. Costello was the man who probably introduced Henry's first wife, Miranda, to the drugs that destroyed their marriage, but Costello has married Miranda and now she wants their daughter, "Pippa," back from Henry – who's scared to death of her mother and Costello. There's one particular aspect of that plot strand that's rather dark and atypical for Christie (Costello sexually abused Pippa), which could be something Osborne added to make the story more appealing to readers of modern, psychological-and character driven novels of crime. After all, the dark cover of Spider's Web is stamped with "A Novel" instead of such vulgar terms as "A Mystery" or "A Thriller," but at least it's less pretentious than "A Literary Thriller." Anyway, moving on. Clarissa doesn't breath a word of the visit to her husband, because he has returned with the rather important tasking of hosting a (secret) meeting at their home between the premier of the Soviet Union and the British Prime-Minister. The only thing Clarissa has to do is leave ham sandwiches and hot coffee in the library, while he's going to fetch the "guests," but in that very same library she stumbles over the lifeless body of Costello – clobbered over the head with something sharp. Luckily, Clarissa has the clarity of mind to do what everyone would do in such a situation: call a couple of friends to hide the body. The three friends are her godfather, Sir Rowland Delaheye, Hugo Birch and a young man, named Jeremy Warrander, who's in love with Clarissa and after some convincing (including setting up a bridge-alibi), they decide to help. To quote Warrander, "what's a dead body or two among friends?" Unfortunately, an anonymous phone call was made to the police telling them there has been a murder at Copplestone Court and they send Constable Jones and Inspector Lord, who doesn't believe there hasn't been a murder and makes things very difficult for them – especially after he's been proven to be correct. Clarissa has to draw from her rich well of imagination, which often wondered what she would do if she ever found a dead body in the library, to find explanations for the ever-expanding web of lies she's weaving to keep everyone out of trouble. Even going as far as drawing up a dummy case against herself, claiming self-defense, to protect Pippa. The living quarters setting and group of friends, having each others back, recalled London Particular (1952) by Christianna Brand, but done in the light-hearted, good natured humor reminiscent of Kelley Roos and the Tommy and Tuppence stories in Partners in Crime (1929). Throw-in a dead antique dealer, a hidden drawer containing an envelope and autograph of Queen Victoria and a good use for that hoary, 19th century plot-device known as the secret passage and you have a fun, fast-paced comedy thriller in which the reader is in the pleasant position of knowing more than Inspector Lord, but not enough to know who's hand is actually behind it all. Not in my case, anyway. I'll return presently with a new review/blog-post.